We couldn't decide between sweet or salty this morning so we decided to go with both. 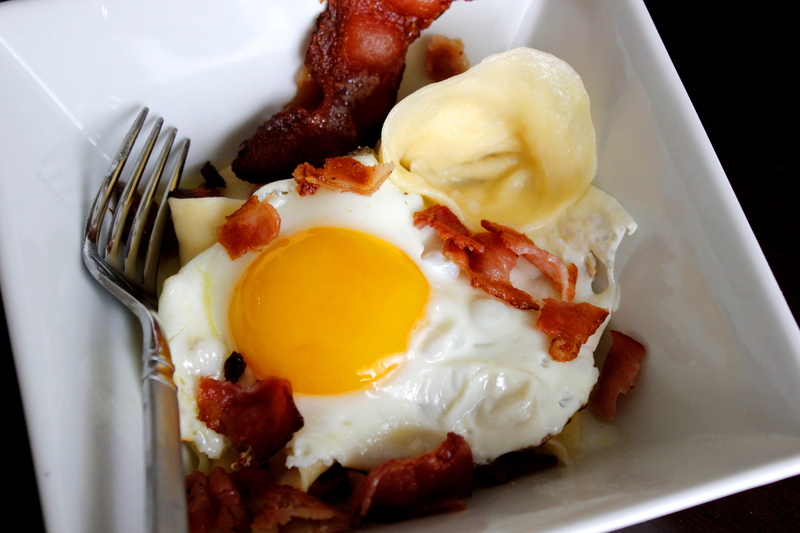 We made a quick sourdough pasta, filled them with maple onions and ricotta, and topped with bacon and a runny egg. It was very satisfying. The salted maple-caramelized onions were delicious -- we will probably end up making a large batch of these and keeping them in a jar in the fridge for everything from cheese plates to burgers. This one takes some time (and some dishes) but it was a nice splurge for a Sunday. Enjoy! 1. Preheat oven to 400 F. Fill large pot half way up with water, cover and start on high heat. 2. Combine water and sourdough starter (follow regular pasta recipe if no sourdough starter available). 3. Dump flour on board and create well in center. Dump liquid mixture into well. Combine until slightly tacky to the touch. Cover with damp towel and allow to rest on board while you continue. 4. Heat evoo in medium skillet on medium low heat, add onions and salt, cooking slowly until they are very tender and brown. Add maple syrup and cook for 5 more minutes. Remove from heat and combine with ricotta. 5. Line pan with foil, lay bacon out on pan in a single layer. Place in preheated oven for 15 minutes or until desired doneness is achieved. 6. Roll dough thinly (1/8") with rolling pin or pasta roller, be sure to flour as needed and keep your board floured to avoid sticking. Cut pasta sheet into 3" (diameter) circles. I got about 10. 7. Place quarter sized drop of filling in center of pasta. Fold over into half moon carefully making sure edge is sealed (use a bit of water if necessary). Be careful not to rip your pasta. Fold corners of half moon to meet and press together tightly to ensure they stay together. Plenty of great videos out there to assist if you do a quick search for homemade tortellini. 8. Heavily salt boiling water. Boil pasta for 4 minutes. When you drop pasta begin cooking two eggs in greased pan on medium heat. 9. 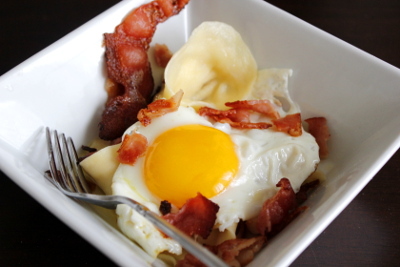 Carefully drain pasta, place in bowl, top with egg and crumbled bacon. Open Budweiser. Eat.